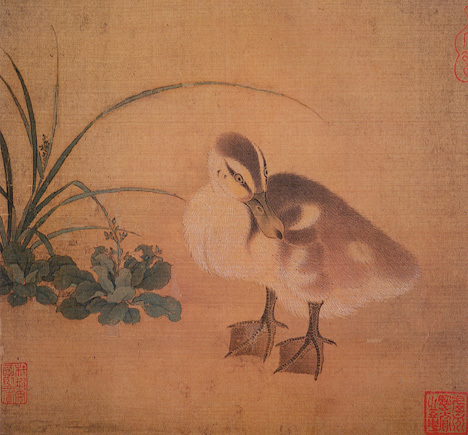 When the founding emperors of the Song defeated the courts of their rivals, they took over their court artists, who included some experts in bird and flower painting. From then on, this type of painting was a specialty of the court. This large handscroll, perhaps originally part of a screen painting, was painted by Cui Bo, active during the reign of Shenzong (r. 1067-85). What is happening in this painting? Can you tell what season it is? 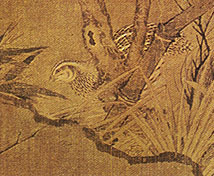 The birds and branches shown here are details from a large hanging scroll, depicting several birds perched in the branches of an old plum tree or the bamboo next to it. 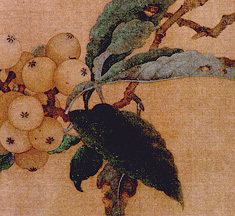 The painting was probably done by artists serving under Huizong (r. 1100-1125). To see the entire scroll, click here. 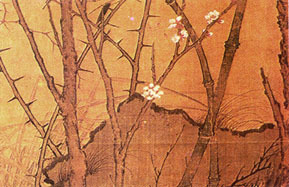 Very similar painting techniques were used by Li Anzhong, a court artist who began painting in the late Northern Song court but joined the Southern Song court as well after it relocated in Hangzhou. Would you be able to identify this bird from the way it is depicted? Throughout the Southern Song exacting depiction of nature was appreciated at court. 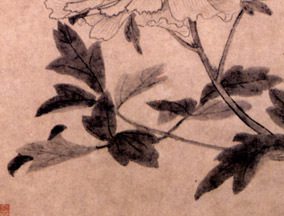 Compare the way this court artist did leaves to the way a somewhat later scholar painter did the tops and undersides of leaves in tones of ink. Of the three album leaves depicting birds shown here, which do you find most appealing or affecting? 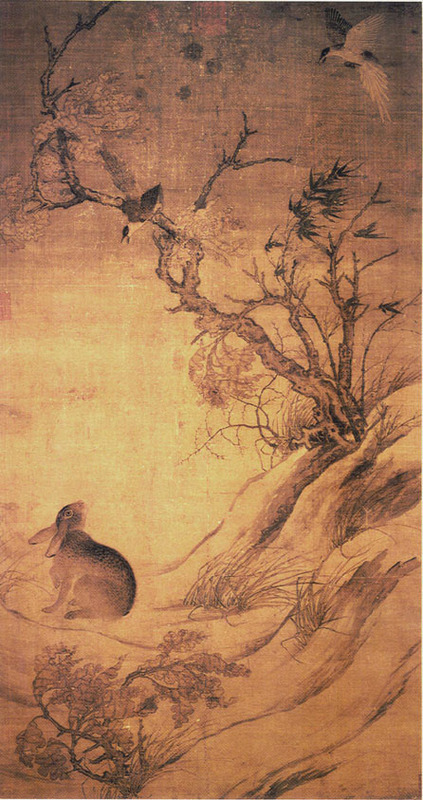 Beginning in Huizong's reign, court painters were expected to be able to couple painting and poetry. 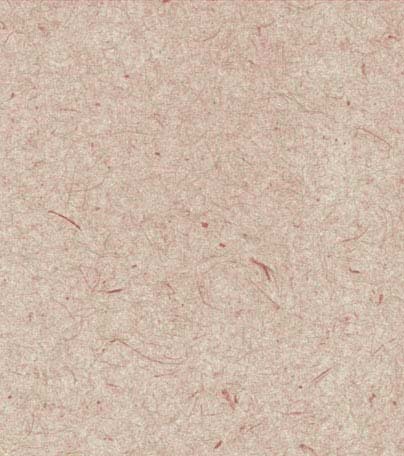 Huizong had painters paint scenes that would match poetic lines. During the Southern Song some emperors and empresses inscribed poetic lines to go with small paintings, especially album leaves. 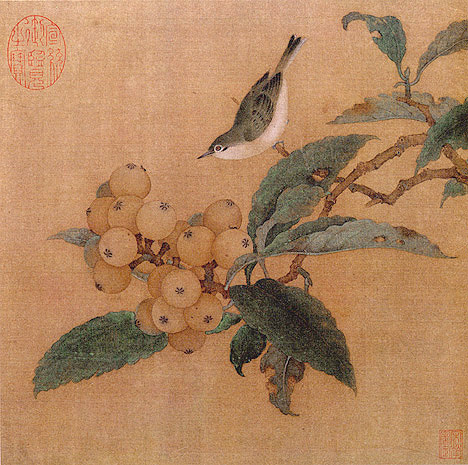 In the painting below, the court painter Ma Lin has painted the blossoming branches to go along with a poem inscribed by an imperial consort. Do you think the painting and calligraphy complement each other here? How would style in calligraphy relate to style in painting? For more on the links between painting, poetry, and calligraphy, go on to Scholars' Painting.